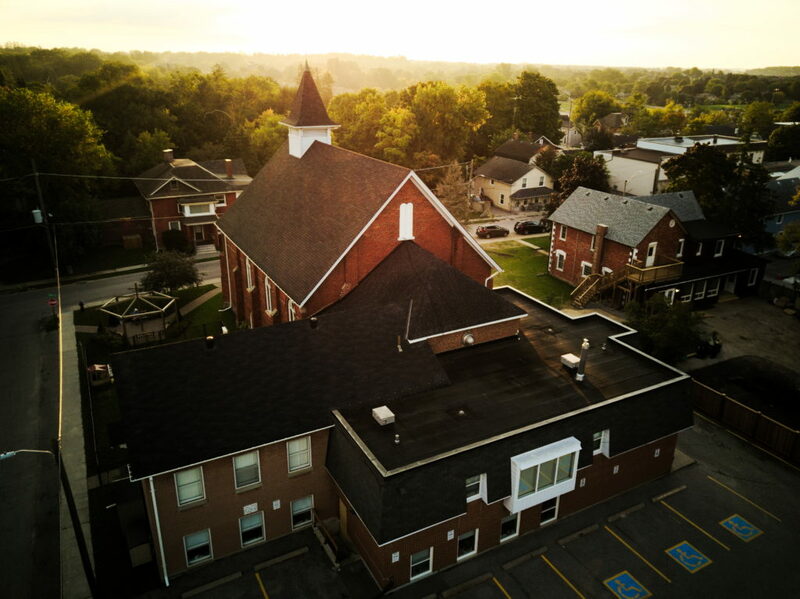 Welcome to Stouffville United Church! Plan to arrive a few minutes before worship service to park (if you are driving) and take a look around. Worship service starts at 10:30 am. Onsite parking is limited. Check out our handy ‘Parking’ (link) page that highlights parking lots in town that we have permission to use on Sundays. Or ‘Go Green’ and bike or walk. There are two entrances to the building. The front entrance is off of Church Street, through the large wooden doors. The second (and accessible entrance) is off the south parking lot area. Both are open on Sunday mornings. As mentioned above, the entrance off of the south parking lot has accessible doors and a life suitable for standing and wheelchairs. Also, large print bulletins and hearing-assist devices are available, just ask a greeter when you arrive. At the beginning of Sunday worship adults and children sit together. If your child is age 2 or under, they can be taken directly to nursery care which is available at any point during the service in the Friendship Room. The Friendship Room is located through the doors on the right by the choir loft, follow the hallway, and make a left turn. Children ages 3 through 12 proceed downstairs after the opening of worship for children’s worship. Our Children’s Worship Program Leader makes sure that every child is in the right place. One parent should accompany your child the first time in order to fill out a registration sheet. At Stouffville United you will find people dressed in various ways. Some will have blue jeans and t-shirt on, others may be wearing a coat and tie. At Stouffville United we encourage you to “come as you are”. What can I expect in the worship service? We consider Stouffvillle United to be a family church. With that in mind, you can expect to sing some of the familiar hymns of old which hold a special place in the hearts of many of our senior members. We will also sing some of the more contemporary praise and worship songs that speak to the hearts of the younger members. You can also anticipate a sermon that is biblical, clear and applicable to everyday life. In all of our services it is our desire to build our spirits as we build our lives in the way of Christ. A bulletin outlining the order of service and announcements are provided weekly from the greeters. How long is the worship service and what happens afterward? The service is generally an hour long. After worship children and adults, who wish, are welcome to gather for a time of informal refreshments and conversation. Some people stay for 5 minutes, most have left for other activities in their day within a half hour. Throughout the year we offer a variety of small group gatherings, some for learning or praying, some for helping others, and some for fun. Feel free to join in when you are comfortable doing so. But first off, fill in a Connection Card on Sunday morning (located in the pews) and we will begin to connect with you by sending you our church newsletter, notices of special events, and inviting you to our Welcome lunch which are held twice a year. Would you like to receive our e-Newsletter “News of the Week”? If you need further assistance, please do not hesitate to contact us at 905-640-1163 or by email office@stouffvilleuc.ca.